For residents of Midwest City, Oklahoma there is an interesting way to see inside your sewer pipes. It’s called a sewer camera inspection and it allows us to get a view that cannot be found in any other way. Why would anyone want to peer inside a sewer pipe in the first place? That’s a good question and we hope to be able to give you the answer you need with some details related to the process. At NuFlow OK we use what is called trenchless technology for all of our sewer repairs and inspections. What this means is that we do not dig a trench in your yard so that we can locate your pipe. Nor do we dig a trench in order to remove you pipe should there be a problem. Instead, we dig one or two small holes down to where the main sewer line connections are located. One set will be near the building being serviced and the other one should be near the street where your sewer line joins a municipal main line. After we can open the pipe connection we insert a small video camera. The video camera gives us a pair of eyes inside your sewer pipe. With those ‘eyes’ we can take a very close look at the condition of the sewer pipe as well as identify any problems that may be revealed with the camera. They could be a clog forming or a leak. The camera will also show us where a break, cracks or a collapse is located. It is with this information we are able to diagnose the problem and plan repairs, if needed. As stated above, a pipe inspection with a video camera can reveal several issues taking place inside your sewer line. It also allows us to see what kind of material was used in your pipes. If your sewer lines are ceramic or made from clay, they will give us an approximate age. The older your sewer pipes are, the more likely they are going to develop a problem. Also, a video pipe inspection can help us to spot a problem long before it develops into something more serious. It is a great form of preventative maintenance that should be repeated regularly to monitor the condition. The cost of a video pipe inspection is far less than an actual repair and that is why we suggest you should consider having your pipes inspected at least once to know for sure what is going on underground. That’s because since you can’t normally see the sewer line, you won’t know if there is something wrong until it’s too late. You can avoid that situation by just giving us a call at NuFlow OK. We will schedule your appointment if you contact us at our office at 405-562-1111. 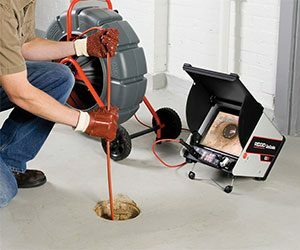 Let us put your mind at ease about your sewer line with a video inspection this month.